I had a honkin’ big zucchini from a friend’s garden. Actually, that’s what led me to search for a new recipe, that baseball bat of a squash lording over the tiny cherry tomatoes on my kitchen counter, issuing a challenge. I saw a version of this dish on Food52’s website, submitted by dymnyno. She called it Zuccaghetti. I kept the general technique but changed the sauce to accommodate what I had in the house. When you salt the zucchini and let it sit, the texture changes. The strands become flexible, like cooked fettucini, yet somehow retain their crunch. I kept the sauce simple in order to focus on the lovely “noodles.” I’ll try this with some lemon zest or fresh herbs other than chives as well. Halved, seeded cherry tomatoes would also be lovely. 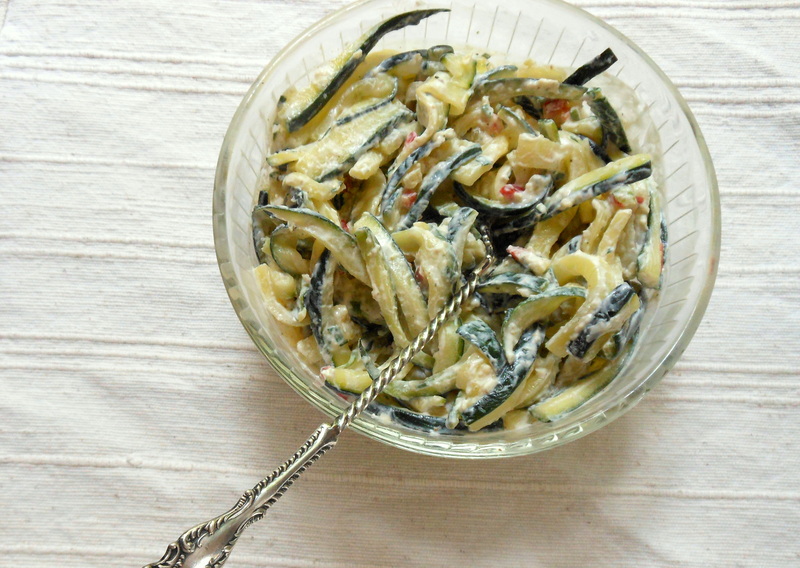 You’d expect that the zucchini noodles would be overly salty, but the balance is just perfect. I mixed the sauce in at the last moment, thinking that it would become watery if it sat too long — an unfounded concern, it turns out. I had the leftovers for lunch the next day, with some leftover grilled salmon mixed in. Heaven. Sprinkle the julienned zucchini with 2 tsp. salt and toss with your fingers to mix well. Place in a colander or strainer and set aside to drain for 30 minutes. Meanwhile, stir together the sour cream, garlic*, 1/2 tsp. salt, chives, and black pepper, along with the chile if using. When the zucchini is done draining. dump it into a clean dish towel and squeeze the heck out of it. *I grated 1 small clove of garlic on my mircoplane. You could also use the smallest holes on a box grater. Grating ensures you don’t get a big bite of raw garlic; the grated garlic melts into the sauce perfectly. 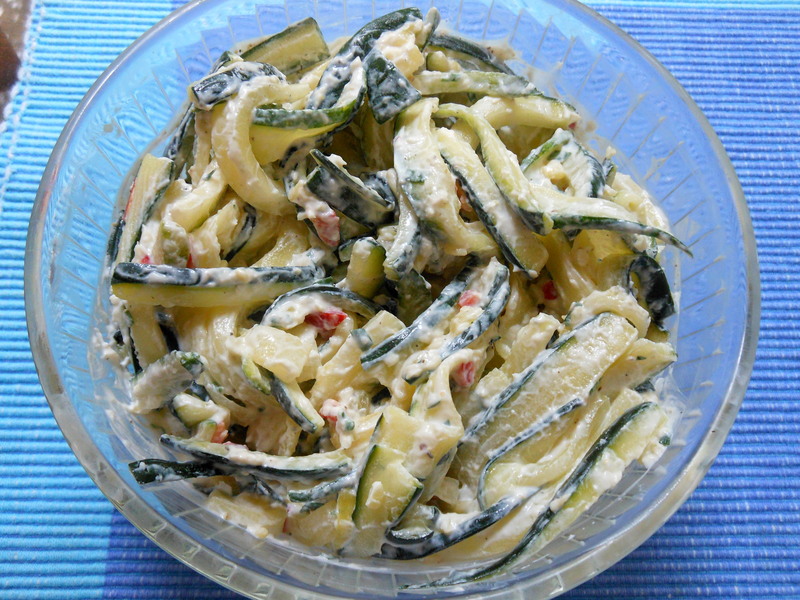 Put the zucchini into a bowl and stir in the sour cream dressing. Taste and add salt if necessary. Eat immediately, or let it sit for 1/2 hour to allow the flavors to meld. Will still be delicious the next day. This entry was posted in salads, sides, veggies and tagged healthy, noodles, salads, vegetarian, zucchini. Bookmark the permalink.